Do you ever wonder why an airline’s communication strategy can crash and burn in a crisis? A lack of understanding an acceptable aviation communication strategy can, in this fast world of social media, ruin a company’s credibility in the aviation industry. 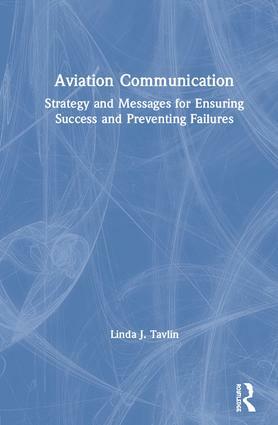 Aviation Communication: Strategy and Messages for Ensuring Success and Preventing Failures is the first go-to book to reveal to everyone in the aviation industry how to stop an organization’s communication strategy from becoming the tragedy-after-the-tragedy that we’ve seen so often. In such instances, after the media go home, the economic, political, regulatory, and legal effects can linger for years. The strategies and messages in this book show how to prevent this along with the ultimate safety net used by those who have been successful. Readers will learn to prevent catastrophic communication mistakes with strategic templates for a wide array of scenarios, as well as 25 specific techniques that give the actual words to use to deliver the book’s messages. This book is a must-have for the international aviation business community as a tri-functional induction, training, and reference tool. Linda J. Tavlin is the president of an international aviation communication consultancy with over 30 years’ experience training organizations on how to deal with controversial audiences. Linda teaches aviation communication in the accident investigation and safety programs at Cranfield University, UK.